King Ranch Chicken was the number one daily special at the restaurant that I worked at in college. Regulars would rush to get there before it sold out, employees came in on their day off, and we often bribed the cooks to hold a bit back for us if we were working that day. We served it with a side of salsa, and it was usually accompanied by green beans and a salad, but nobody paid attention to the sides… the King Ranch Chicken casserole was the main dish.. the star… with it’s cheesy, crispy, spicy goodness, nothing else served that day could hold a candle to it. As a server, line cook, and eventually restaurant manager, I ate, served, and made this King Ranch Chicken recipe more times than I can count. At some point, I re-typed the stained pages of our recipe binder, so the recipe lived on a back up drive for a few years, because at that time, I was able to make this for a crowd of 100 or a group of 10 without a thought. 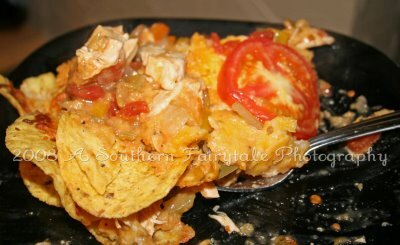 This recipe is still one of my favorites, and not just because it’s rich, savory, crunchy, cheesy, and spicy; but because some of my favorite memories from that time of my life involve this King Ranch Chicken recipe. Hours of my life were spent scraping chips and cheese off a plate with friends, and co-workers, some of my regulars still hold a very special place in my heart, over a decade later, I could practically pinpoint the moment they’d walk in the door on King Ranch Chicken Day. I can tell you how many salsas they wanted, who wanted extra jalapenos, who liked theirs with sour cream, who had two beers with theirs, who wanted double green beans, and who’d finish off their double portion with extra tomatoes and leave a 25% tip. Not only do I have the most wonderful memories of this recipe from the restaurant, but this is one of the first dishes that I started making for friends and family in our neighborhood when we were newlyweds and when Princess was a baby. This is the recipe that forced me to learn how to write recipes for others to follow. About 4 lbs cooked chicken, breasts or whole de-boned, chopped or shredded, your choice. 1 lb shredded cheese, sharp cheddar or Mexican Blend… whatever floats your boat. In a large skillet over medium high heat drizzle 1 Tbsp olive oil: add the onions, peppers, jalapeños, chipotle peppers and tomatoes. Cook until the onions become slightly translucent and your kitchen smells like heaven. Add the soup, broth and chicken. Bring to a slow simmer. Add Spices. Bring to a slow bubble, stirring occasionally. The mixture should be hot. In a large baking dish (9x13) place a layer of slightly broken tortilla chips or tortillas, top with a layer of the ‘mixture’. Cover with cheese. Bake uncovered at 375° for about 30 minutes or until the cheese melts into bubbling golden goodness. originally posted on A Southern Fairytale in 2008. This is the picture that accompanied the original post. Have a great time! Enjoy yourself and your kidlessness! Mmmmmm this looks so good. I made the Wamsutta yesterday and it was met with enthusiasm once everyone tried it. MMMMmmm. Luckily I still have 1/2 of the recipe in the freezer for later. Chicken? A favorite. Cheese? A favorite. Chicken & Cheese together?! I’m totally there! I love King Ranch Chicken. Is it very spicy? And, I wish you would’ve had a good long layover at the airport. I so would’ve driven over to have lunch with you. Pass me the plate please! That 3/3/3 salt, pepper, garlic mix is ingenious! You really don’t want me to shed this guttage do you. Fine, I won’t. That was easy. Wow this looks good. We have a few chicken casserole recipes that we can make in a heartbeat that taste yummy. I alwasy love new recipes. It’s fun to experiment with different cream soups too. Have a great time at BlogHer! This recipe looks delish. HAVE THE BEST TIME RACH!!!! Ps.. this dish looks freaking amazing!! Your recipes are always so delicious! I love the Southwestern flavors you tend to favor. Have an absolute blast in Vegas! We have a similar dish in our family lovingly known as “GLOP.” Seriously. I’ll have to try yours! mmmm…yummy! All right, I’m making this tonight. Or, rather, it’s in the oven right now. I think I used to many jalepeno peppers tho and my children will turn their noses up at it. Also, it looks like vomit. So damn it girl, it better taste good. .-= Tanis Miller´s most recent blog ..Nickelback Makes the World a Better Place =-. I made this a few weeks ago and used 1/2 of the jalapenos called for. Now, let me say, I like spicy food but this was soooo hot. Maybe I just had some super spicy jalapenos!